Excuse me while I geek out, but I have a confession to make. Despite being an enormous comic book fan (both of the superhero and non-superhero variety), I was never really into the X-Men. When Marvel’s Mutant Genesis initiative rolled along in the early 90s and relaunched the X-books, I bought into X-Force, Uncanny X-Men, and X-Men but dropped it all together after a couple of issues. Instead, I fell in love with the quirky Excalibur book by Alan Davis. To this day, I still love those Excalibur issues. Fast forward to 2014. I had (ahem) “appropriated” some files of Chris Claremont’s early X-Men run and I decided to give it read. I instantly fell in love with it. Although somewhat dated, I realized why the X-Men became such a hit. I quickly bought Uncanny X-Men Omnibus Vols. 1 & 2 (who says piracy leads to lost sales?). 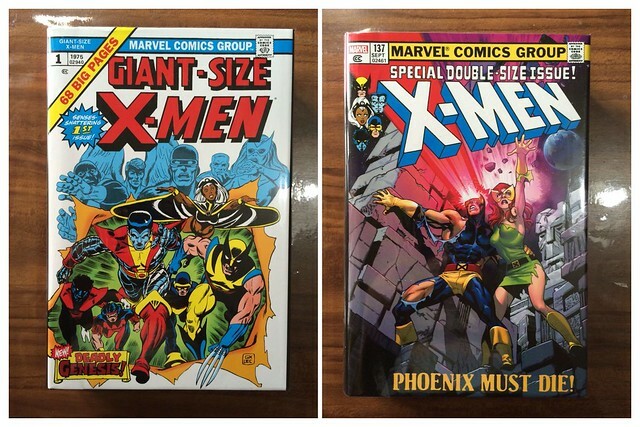 These volumes featured classic tales like the Proteus Saga, The Dark Phoenix Saga, and Days of Future Past and I suddenly found myself hungry for more X-Men stories. These days, the X-Men is a whole franchise unto itself. The current book being written by Brian Michael Bendis entitled All-New X-Men features the original 1960s X-Men roster transported into the present time. The run provides a perfect counterpoint to the Claremont stories, like book ends of long epic. Reading Kitty Pryde evolve into the mentoring “Professor K” (essentially playing the role Professor X served in the early X-Men run) provides a nice symmetry with her 1980s introduction as the youngest and greenest X-Man. So, if anybody is on the fence with these Omnibus editions, I say go ahead and jump into these books. They feature solid superhero stories and the beginnings of some of today’s best loved Marvel characters. ‘Nuff said. *footnote: Although I never really got into the X-Men in the 90s, I bought and loved Grant Morrison’s New X-Men which I felt was a very contained and complete story from start to finish. Way back in 1991, the eruption of long dormant Mount Pinatubo spewed out enough debris and particulates into the air that it lowered global temperatures. Over a hundred kilometers away in Quezon City, where I live, the sky had begun to darken by around 3 or 4pm. The following morning, the city was covered in white ash. It was as if, for the first time, there was snow in the Philippines. I was 13 years old at the time. Many years later, I made a silent comic inspired by that little moment in history. I entered it into the 2nd Fully Booked / Neil Gaiman Graphic Fiction Competition and it didn’t win anything. Didn’t even get into the shortlist. Too bad. Boo hoo. Anyway, a couple of months ago during one of our regular INK (Ilustrador ng Kabataan) meetings, I presented the comic, but this time with a couple of transition effects. It’s like a very primitive motion comic. Hope you enjoy it. Last week, I got a notice from the Quezon City post office to pick up a package. I had an idea what it was. Although it was only late by almost 2 years. Our anthology book, Lingua Comica Reloaded had arrived. Book design by Plastic Soldier Factory. Amelie and I collaborated on a game board based on the Game of the Goose. The book also has a poster/comic insert entitled “Numbers” made by another team. 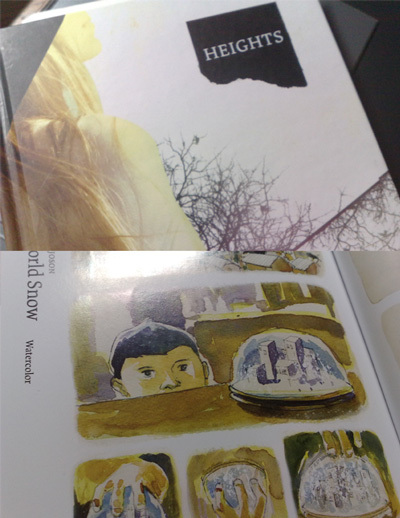 The book was a collaboration by artists from Europe and Asia and funded by the Asia Europe Foundation (ASEF). Several groups pitched their story ideas before ASEF finally chose the line up for the project. I teamed up with French Belgian Amelie Clement when we realized we were on the save wavelength after a couple of emails. When we got the grant from ASEF, we decided to spend it by going to Angouleme and conducting a mini-residency. Angouleme is a sleepy town in southwestern France and known for festivals such as the Circuits des Remparts and the Festival International de la Bande Dessinee (wiki here) – or the International Comics Festival. Too bad we couldn’t visit Angouleme on a January when the Comics Festival is held. Although we were on hand for the Circuits des Remparts, when fancy cars from all over Europe came roaring into town. I, unfortunately, am not a car geek. So the festival was wasted on me. I spent the entire holiday doing a comic page. There must be an easier way to make comics. But I don’t know what it is yet. Hopefully I’ll find out this year. Two pages digitally pencilled and inked took me one whole day. My hand hurts. Here’s a page from my long delayed comic, warts and all. This page was done completely in Photoshop with the help of my trusty pen tablet. It’s frustrating to know that I still have so much to learn. I’m thinking of changing my process for future projects and abandoning this style completely. We’ll see how it goes. It didn’t get noticed in the recently concluded Neil Gaiman/Fully Booked Graphic Fiction Competition. But I guess this is a good enough consolation. 3rd World Snow finally got published and it seems fitting that it appear in Heights – the literary organization I was part of when I was studying in the Ateneo. The good people from the org sent over copies of the book via courier after I told them that it would be difficult for me to pick it up while still working in Makati. The package arrived today and I so love receiving packages like this. I made this little story during the Lingua Comica workshop in London two years back. It was part of a collaborative piece I did with my Indonesian-Italian partner Paola Cortese. It was supposed to be appear in a compilation of our works but until now, we have no word about the status of that book. But even if 3rd World Snow makes it into an international publication, the version printed in Heights is the definitive full-color piece. Comics smart guy Scott McCloud speaks on Ted Talks about the future shape of comics. It’s basically stuff that’s in his book Reinventing Comics, wherein he talks about applying comics onto an “infinite canvas” with the use of digital technology. This was written way back in the late 90s and despite the proliferation of webcomics, digital comics won’t be replacing the printed page anytime soon. Granted that comic scans are now widely available, the format still makes use of the printed page and doesn’t adapt the content to the peculiarities of the digital medium. Comics geeks interested in formalist comics experiments may also find the work of Daniel Merlin Goodbrey very interesting. I studied his work in preparation for my thesis and this particular hypercomics piece blew me away when I first saw it. I became interested in how comics could tell non-linear stories. The way the images were composed also reminded me of Chris Ware‘s work, another comics genius. 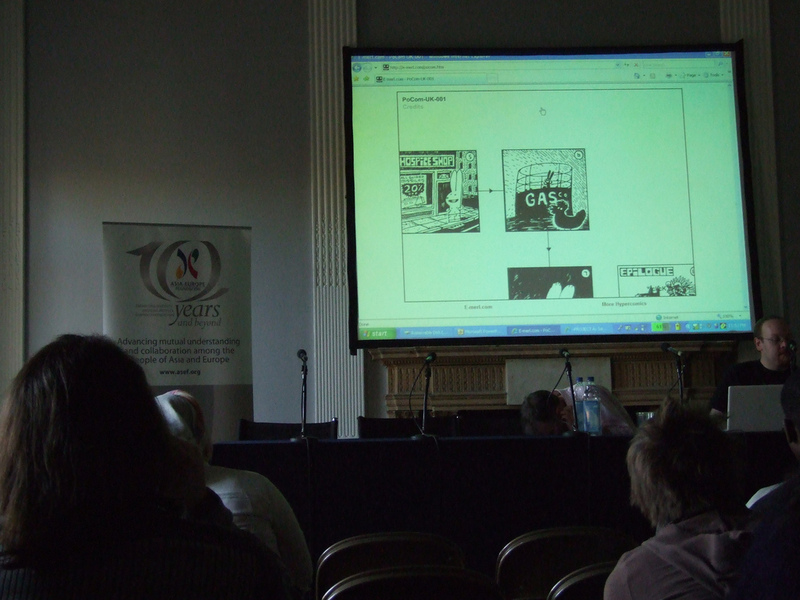 Imagine my surprise when I found out Goodbrey was a speaker at the Comica Festival when I was there for the Lingua Comica Project. He presented his work in hypercomics and this piece in particular. I found out it was a collaborative project created for the wall of the Institute of Contemporary Arts as part of a previous Comica Festival. Goodbrey applied McCloud’s concept of an infinite canvas through the use of a flash-based zooming system called the Tarquin Engine. Another web based comic is When I Am King, created by demian5. The piece has been in the internet for ages. It’s irreverent and nonsensical but a pretty fun read. As we move into the future, even more printed content will migrate to the digital world. Already, economic and technological upheavals are changing the face of publishing (read Time.com’s article on “Books Gone Wild: The Digital Age reshapes literature”). In Japan, “novels” are being created and read on mobile phones. Now, there’s a comic reader application for the iPhone. Even an established traditional comic publisher like DC Comics has established their own webcomics division called Zuda Comics. Now, I don’t know what comics will be like in the future. I, for one, still like reading it the old fashioned way – printed on paper. That way you can smell the pages and curl up with in bed. But make no mistake, the future will come one way or the other.